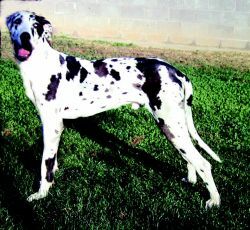 a very large (28-32 inches tall) dog with broad head, small ears carried erect but folded over, a long neck and long tail. Called also German mastiff. The breed is predisposed to cystinuria, spondylolisthesis, osteochondrosis, hypertrophic osteodystrophy and gastric dilatation. I hit the jackpot and had my second aha moment at the diocese when I found a marriage license dated April 1797 between a Vicente Alano y Servia and a Margarita Nadal. "A story of the French revolution, lost keys, and the Calaix de Sastre"
Ya era tiempo de que los europeos empezaran a tomar un poco las cosas en sus manos", dice Alano Hotel. In his key note address, Undersecretary Alano emphasized the timeliness of this type of workshops as the region sees unprecedented growth in seaborne trade, regional connectivity, and integration to the global supply chain. En estas discusiones destaca Alano de Lille, un tema que desarrollan Andreas Niederberger, colaborador de Lutz-Bachmann, y Francoise Hudry (Paris). Players who matter: It is critical that center Alano Ciliberto (6-3, 285) and his offensive linemates open holes for the new running backs. The Philippine Navy through the Naval Air Group (NAG) conducted today activation and blessing ceremony of the Beechcraft King Air C-90 Aircraft held at Hangar 2, Headquarters Naval Air Group, Naval Base Heracleo Alano, Sangley Point, Cavite City. This was followed by the ribbon-cutting ceremony and official store blessing led by Jollibee Philippines president JJ Alano with Taguig City Mayor Lani Cayetano, Department of Trade and Industry Undersecretary Nora Terrado, Miss Universe Pia Wurtzbach and Jollibee BGC Triangle Drive restaurant manager Sharon Morendo. Razo, the Commander and Deputy Commander of Philippine Naval Special Operations Group (NAVSOG) were present during the ceremony held at the Naval Base Heracleo Alano in Sangley Point, Cavite. Government officials who graced the event included vice-consul Kristine Bautista, culture attache Richard Billedo, deputy labour attache Violeta Illescas, SSS officer Mike Ingal, Pag-Ibig information head Pamela Bautista, and welfare officers Philip Alano and Lenny Cleofas. A turnover ceremony in the US last May was attended by Armed Forces Chief of Staff General Jessie Dellosa and Philippine Navy Fleet commander Rear Admiral Jose Luis Alano. But Batioco stole the ball from Alano, hit a layup and made the free throw after drawing a foul to complete a three-point play that gave Rio-Trading a place in Inter-Company Group C finals.